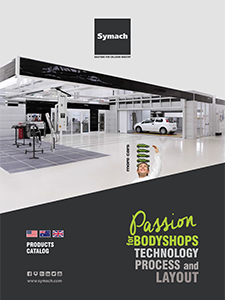 Symach has sold the first bodyshop in Burlington (Toronto) to CARS of Nick DiLuca, partner of CSN, a group with more than 330 bodyshops in Canada. The new bodyshop will be operational in November and will be built entirely with the Symach equipment and with the FixLine formula. The process of preparation, painting and drying are automated with Symach robots. The new bodyshop will repair 50 cars a week, reducing the cost of repair around 25% and reducing the key to key time to 1.5 days on average for more than 80% of the repairs. Osvaldo Bergaglio I know well Nick and I would say that we also became friends in the past three years; in fact, Nick spent last three years, comparing our equipment and our formula of bodyshop with those available on the market. Once all the checks done, Symach is resulted the best in knowledge in design of the repair process, as well as for quality, cost and aesthetic design of the equipment. I personally started a little over a year ago to promote Symach in North America and this first result is very important to guarantee us a bright future, which is why I am investing in Toronto with the opening of a Symach store for the sale of products and for maintenance service because I want to do the best for my friends because from several years i have not only customers but friends…. Much more difficult to please them….. Nick DiLuca We are very excited about being the first shop in Canada to install the Symach system in our shop. The product is light years ahead if it’s competitors. We at CSN Cars are confident it will reduce are key to key time drastically, and enhance our customers experience.